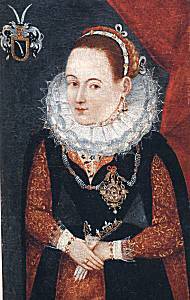 Afra von Fleckenstein, 2nd half of 16th c.
oil painting, private ownership, 31.4 x 17.3 cm. The family history says that this miniature portrait shows Afra von Fleckenstein, eldest daughter of Henry II von Fleckenstein and his first wife Anna Klauser. Afra was married in 1573 with Jost Segesser von Brunegg (died in 1592), who was in the foreign Service of Rome and the Swiss. Coat of arms: Segesser von Brunegg.